Stock photo of a horse farm, where–as far as we know–no manure pile fires have ever occurred. 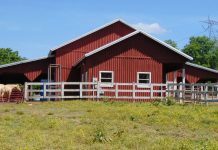 We talk a lot about summer hazards at the barn during this time of year, but we’re usually thinking about the potential for heat exhaustion in horses and riders, the annoyance of flies, or the effects of hot, dry weather on pastures. That weather can lead to another hazard we really haven’t spent any time at all talking about at all: Spontaneous combustion. You’ve probably heard that if hay isn’t completely dry (below 15 percent moisture content, according to Washington State University Extension) and is then stored in tightly packed stacks of bales, the heat created by microbial growth at the core of the pile can become high enough to start a fire. Hay is highly flammable, and while this scenario is relatively rare, it can be devastating when it happens. The same effect was most likely at work when a manure pile at a farm in the Finger Lakes region of New York spontaneously combusted on July 5. In this case, the heat produced within the large muck pile was exacerbated by the hot, dry weather. According to The Associated Press, this wasn’t the first time the farm in question had dealt with manure pile fires. The July 5 incident in particular caught the attention of New York’s Department of Environmental Conservation because neighbors complained of the smell. The AP also reports that it took three fire departments two hours to end the blaze. The article does not report the name of the farm or whether there was any damage due to the fire. Is your muck pile at risk of spontaneously combusting? Probably not unless it gets really big and the weather allows it to dry out. Spreading your farm’s manure or having it removed periodically will prevent combustion conditions from occurring. Manure, used bedding and old hay can also be composted; when done correctly, the pile will be kept moist and aerated which will prevent combustion. The smell starts out like an old meat smoke house. The first pile started in the winter after a very hot,dry summer. I smelled it for weeks before small flames started up on the surface. The pile was started on the edge of a hill and piled out like a sand dune. It burned for a few weeks and could not be put so just burned away. Snow and rain kept it from being an issue. The next pile was moved to a more open location on a less steep hill where it was much easier to take out by truck load. The run off from the wash rack kept some of it pretty wet. It took 27 years for that one to catch fire and happened in the summer. The better location meant that it could be spread out and sprayed out. Manure has to be kept turned for Composting so the heat can be controled or removed and spread so that it cannot get hot. Fair barns and horses are burned every year because people can’t seem to understand just how hot these piles get. Next time you go to the barn get a shovel and dig into what is about two weeks old. You my be surprised that it burns your hand. Please do not let the piles get very big or sit around for long or it could be deadly.